Coin Smash is a free game for Windows 8 and 8.1 which allows you to test your aim. When you launch the game on your device, you will be taken to an interface where you’ll be able to see three coins. The aim of the game is to avoid the circle and hit the coins as many times as possible by properly aiming the coin striker on the other coins. 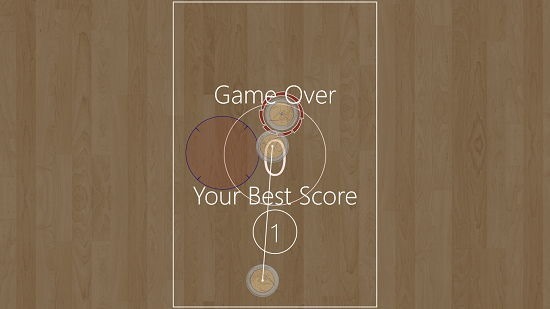 Although the game’s controls sound very easy, the game is a bit hard to master as it requires extreme skill to aim correctly with the correct shot power. When you click on the coin striker, you will be shown an indicator of where the striker will go when fired. Just drag your finger or your mouse pointer along that aim guide to fire your coin striker with appropriate power. Coin Smash is available for free from the Windows App Store. When you run the game on your device, you will see the below shown screen. This is the gameplay screen itself. As you can see when I click on the coin striker, I am shown an aim guideline marked by blue arrows. This will show me where the coin will go. You can move your finger around while holding the coin striker on touch screen devices or you can move your mouse around on non touch devices with your left mouse button pressed to alter this aim guideline. Simply click and drag your mouse (or your finger) along the guideline shown and the speed with which you drag it will determine the firing speed of your coin striker. The game calls for hitting the coins as many times as possible without missing. It’s game over as soon as you miss. In the above screen you can see your score as well as your best score. To start a new game simply tap or click anywhere on the screen and a new game will start. This winds up the main features of Coin Smash for Windows 8 and 8.1 devices. Coin Smash makes for a good pastime application on your device to while your time away. You can get it for free for your device by heading over to the link below.